Fly Fishing Lesson on Lake Kiowa This Morning – Wow, it was a pleasure to be able to give a lesson to a very eager retired couple on Lake Kiowa, Texas, this morning. We had the entire place (The Lodge grounds) to ourselves, and the weather was pristine. No wind, and I think maybe two boats passed during the entire beginner lesson. They have a hankering for some trout, but I also had to keep them in the loop on fly fishing for bass in their very “bassy” lake. I had a photo shoot in Houston, so I wrangled Danny Scarborough (DS) into showing me this “Brae’s Bayou” thing he’s been talking about for a long time. It didn’t look like what my mind’s eye created whenever I saw photographs of the place, and even further from that when I was actually in the “bayou.” It’s a concrete drainage ditch, okay? While we were there, the rains that were predicted came, and they kept coming. While DS was tuning into the fish he was seeing, I was tuning into an escape route for the wall of water I was sure was just around the bend. When you’re in these things, the water can rise on a sunny day – just like happens in the Colorado drainages. It’s one thing to be frustrated seeing and not catching fish in the open “wild” water. 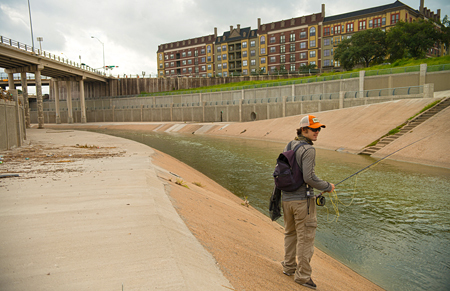 It’s entirely another to see fish swimming along with no cover, along a concrete bottom, and realizing they are 100-percent more “tuned” than in the wild. They know they are constantly vulnerable. Anyway, this is the short version of this story because I will have to get back down in the ditches to get more “catching” images to go with the story. I shot features aplenty, but the water went from placid to raging, going up close to two feet, in a matter of minutes. That spelled disaster for Saturday, and after we saw more clouds headed our way, we retreated … DS catching a tilapia, and me hooking a mullet (in the mouth, yes, a mullet, in the mouth), on our way out. 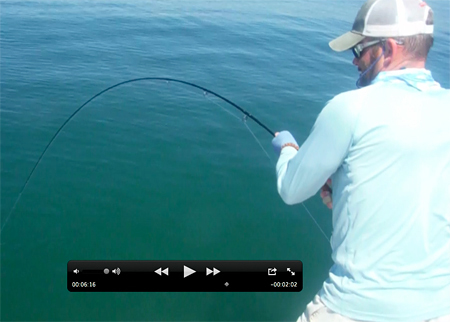 Closest thing I can imagine to a bonefish, a twelve inch mullet jumped to my eye level (three feet straight up), zipped off drag (on a 7 weight), and was off. That last part really brings me to the point on the ditch fishing in Houston; you never really know what you will encounter. It may be grassies, buffalo, common carp, cichlids, catfish, and yes, mullet. The mullet are everywhere. 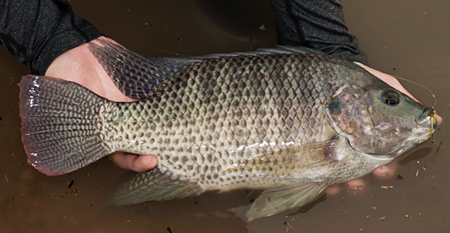 Brays Bayou tilapia caught on fly during the height of rain drainage. I hope this doesn’t sound too simple – fish in a concrete ditch – because it is anything but simple. Clint Keating (CK) sent me a link to a bunch of images he made while fly fishing in the Port O’Connor jetties, and unfortunately none of the images contained fish-in-hand. He did, however, tell me there are “tarpon everywhere” and they did manage to hook jack crevalle – trophy size – but the fly came loose. 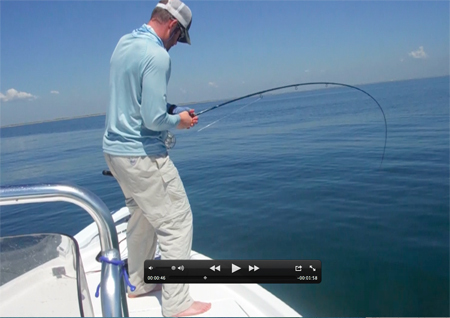 Also, as you can see, there were numerous encounters with toothy Spanish mackerel. I am anxious to see what, if anything, is left of my fly box that went down there with them! Well, (my) flies are made to be eaten. I will figure out a way to get more details out of CK on his trip. It sounded like a real mind bending learning curve as the text messages started coming in. I hope my flies didn’t contribute to fish coming unbuttoned. The weekend of October 4, 5 and 6 is “one of those” weekends where everyone is going somewhere cool to fly fish. Everyone, but me that is. The list of clubs that have trips going is very long, and crosses the entire State of Texas, and into Oklahoma. Me, well I am going exactly where I should – where economic opportunity crosses my path, and that’s to the Chicken Farm Art Center show in San Angelo, Texas. I will be there in support of my lovely wife’s business – Cimarrona. This is the first show of the fall, and if you are unfamiliar with her products, please feel free to visit www.cimarrona.com. If you hold true, you won’t tell her I sent you, but that’s okay. She’s also doing a giveaway on her Cimarrona Facebook page. I think that’s an 11 weight CK is using. Do the math on that one!